The school calendar is now available! It features artwork from all year groups from S1-S6 and is £6. The calendar has also been supported by many local businesses. It’s available to buy at the school office, library, Cornerstone, Farm and Garden Store and Poolewe Village Store and other local outlets around Gairloch area. All profits made go towards school funds. They will also be on sale at the Senior School Exhibition opening this evening to which all are welcome – from 5.30pm in school library. Ghabh an Deasbad àite ann an e-sgoil Steòrnabhaigh air an t-seachdamh is an ochdamh latha den t-Samhain. Dh’fhàg sinn Geàrrloch tràth madainn Dimàirt is chaidh sinn air a’ bhàt’-aiseig tarsainn an Cuan Sgìth gu Leòdhas. Ro-làimh bha sinn air a’ chiad is beagan den dàra deasbad ullachadh eadar an sgoil is an taigh. 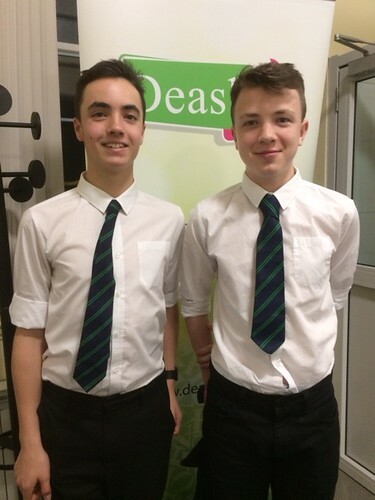 The Debate took place in Stornoway’s e-school on the seventh and eighth of November. We left Gairloch early Tuesday morning and took the ferry to Lewis. We had prepared the first and part of the second debate beforehand, between school and home. Ghabh sia sgoiltean deug pàirt. Dheigheadh ceithir sgoiltean troimhe dhan iar-chuairt dheireannach ann an Dùn Eideann. Dh’fhuirich sinn aig Taigh-Òsta Chaladh airson dà oidhche agus ghabh sinn ar biadh an sin cuideachd. Sixteen schools took part in the debate but only the top four would go through to the semi-finals in Edinburgh. We stayed and ate in the Cala Inn for two nights. Dimàirt bha sinn an aghaidh Sgoil Drochaid na h-Easbaig agus b’ e am moladh gum “bu chòir reifreannan a bhith air an casg gu tur.” Bha sinne an aghaidh a’ mholaidh. Diciadain bha sinn an aghaidh Sgoil Lìonacleit à Uibhist. B’ e am moladh “gu bheil sinn fhathast a’ cur cus luach air ceum oilthigh.” Bha sinn airson a’ mholaidh. On Tuesday we were against Bishopbriggs High School and the motion was, “A permanent ban should be placed on referendums.” We were against the motion. On Wednesday we were against Sgoil Lionacleit from Uist and the motion was, “We still put too much value on a university degree.” We were for the motion. As deidh do gach deasbad a bhith air an crìochnachadh, fhuair sinn na puingean againn air ais. ‘S e na sgiobanan a chaidh troimhe Àrd Sgoil Loch-abar, Sgoil Ghàidhlig Ghlaschu, Sgoil MhicNeacail agus sinn fhèin. Bha sinn uile air seachd puingean deug fhaighinn eadar gach deasbad. Chaidh sinn troimhe agus leis a sin bidh sinn a’ siubhal sios gu Dun Eideann ann an trì seachdainean. Once both our debates were over, we received our points. The schools that went through were Lochaber High School, Glasgow Gaelic School, The Nicholson Institute and ourselves. We had all got seventeen points between the two debates. As we went through, we will travel down to Edinburgh in three weeks. Fhad ’s a bha sinn ri deasbad, fhuair sinn barrachd misneachd agus thog sinn sgilean bruidhinn agus dh’fhàs sinn na b’ fheàrr air smaoineachadh fhad ’s a bha sinn fo uallach. Whilst debating, we gained confidence, developed speaking skills and improved our ‘on the spot’ thinking.